Unlock over 8 hours of Bret Hart's greatest matches never-before-released with Bret "Hit Man" Hart: The Dungeon Collection! Handpicked by the Hit Man himself, this set features prized rare matches from Bret's personal Stampede Wrestling library, along with forgotten classics against legends like Andre The Giant, Stone Cold Steve Austin, Sting, Ric Flair, and much more! 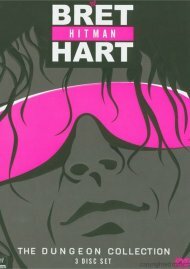 Also, get the inside stories behind the action in the revealing, never-before-seen interview with Bret "Hit Man" Hart. Review "WWE: Bret Hitman Heart - The D"
Reviews for "WWE: Bret Hitman Heart - The D"